Two-way radios are indispensable for business that rely on open, immediately lines of communication between workers for optimal service to customers and fast reaction times to a rapidly changing work environment. That would seem to encompass all organizations, but there are certain industries that especially benefit from the “always connected” nature of portable two-way communication. Radios help improve project management and make working groups more efficient, as miscommunication between team members is greatly reduced. Here are the top 10 industries where walkie-talkies make the world of difference. Retail Stores - Personnel can speak amongst themselves to ensure that shelves are kept fully stocked and customers’ needs are attended to without using the public paging system. This allows for a more seamless, professional business. Also, if someone spots a shoplifter, security staff can be notified discreetly for fast action. Hotels – Managers, cleaning and maintenance crews, restaurant staff, the security team and others are all spread out over multiple floors. Two-way radios allow for smooth, organized and discreet efforts on behalf of guests, while still maintaining a quietly professional appearance. Catering Companies – The work of caterers is time-sensitive, with perfect scheduling the key to customer satisfaction. Client requests, food preferences, deliveries of ingredients, food preparation, meal distribution and many other details can be organized to perfection by using a walkie-talkie system. Medical Practices – There are many moving parts of a successful medical practice – waiting room receptionists, nurses, doctors, cleaning staff and equipment technicians. They can all be organized effectively into a smoothly operating organization to provide the best possible care to patients, attending to individual needs. Car Dealerships – Whether it’s to request that a certain car be brought to the front from a back lot, check on the progress of a check-up by the mechanics or to speak with a manager or the finance department, car dealerships greatly benefit from two-way radios. The salesperson is able to continue to answer customer questions without any interruption in service. Warehouses - Shipping, receiving, loading, unloading, bookkeeping and more – warehouses have a dizzying maze of activities going on at the same time. A two-way radio system can help keep everyone on the same page for a smooth operation that stays on schedule to meet customer demands. Construction – Since they’re often spread out over a large area, two-way radios are frequently used by construction crews to communicate with others on their team, to relay information about a job, ask questions, call for additional workers or relate client requests. Coordinate multiple teams working on a big project and get that project done on time and within budget. Event Management – Hosting a successful special event requires the perfect coordination of many moving parts, from caterers and supervisors to technicians and security. Being able to communicate with everyone at once, or with a specific subset of workers, greatly increases efficiency. Farming – Especially when the farm is in a rural area where cell phone coverage may be spotty, two-way radios are essential, letting the crew cover a lot of ground while still staying in touch. Ensuring that workers have the supplies and equipment they need and can easily radio for help in the event of an emergency keeps a farming operation successful and safe. Security – In the field of security, no issue is too large or too small, and every second counts. With a robust two-way radio system, a security team can patrol a large area, quickly and discreetly calling for backup should a potential problem arise. For customer-facing service companies like retail stores, hotels and medical practices, Motorola CLP radios are highly recommended due to their small, compact size and discreet hands-free operation. 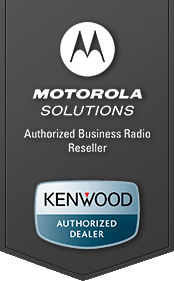 Indoor/outdoor businesses like farms and car dealerships spread out over a large area benefit from the robust Motorola RDX radios. Motorola digital radios are an attractive choice for event management and security teams, since they offer highly secure communications and the ability to speak to the entire team or just one person. Boost efficiency, communication, customer satisfaction and safety in the workplace, wherever that happens to be, with high performance two-way radios.